A man has been found guilty of killing his baby son by shaking him. Christopher Barnes, 28, of Barlavington Way, Midhurst, West Sussex, was convicted of the manslaughter of 10-week-old Harry. The baby died on 25 June 2017 from head and other injuries which pathologists told Lewes Crown Court were consistent with being shaken. Barnes, who was also found guilty of causing grievous bodily harm without intent, will be sentenced on 22 March. 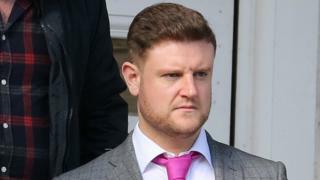 The heating engineer was convicted by a majority verdict after a 10-day trial. He was granted bail until his sentencing. The court heard Harry had been admitted to Southampton General Hospital on 24 June after collapsing at home. Det Ch Insp Emma Heater, of Surrey and Sussex Major Crime Team, said after the verdict: "His heart stopped beating and he stopped breathing. He had suffered profound injury to his brain. "He never regained consciousness and died the next day after life support was withdrawn." She said expert forensic pathologists confirmed Harry's injuries had been "consistent with baby shaking". Det Ch Insp Heater added: "The evidence was clear that Christopher Barnes had become frustrated with Harry and had caused his injuries. "Harry should have been safe with his father, whose duty it was to love and protect his child. "Christopher Barnes's actions have had a devastating effect on Harry's entire family." In a statement issued through Sussex Police, Harry's mother, Laura Millins, said: "We now have justice for Harry after going through something so traumatic that has changed our lives for ever. "As we approach what would have been Harry's second birthday we finally have the truth. Harry will always be in our hearts." Police said West Sussex Safeguarding Children's Board was now carrying out a serious case review into Harry's death.